Nottingham's first civic college was opened in the city centre in 1881, four years after the foundation stone was laid by former Prime Minister, W E Gladstone. After the First World War, the college outgrew its original building. A generous gift by Sir Jesse Boot, of 35 acres of land at Highfields, presented the solution and in 1928 the College moved to what is now the main campus, University Park. Initially, it was accommodated in the elegant Trent Building and was officially opened by King George V in November of that year. Even in its early days on this site, the College attracted high profile visiting lecturers including Professor Albert Einstein, Mahatma Gandhi and H G Wells. The University of Nottingham's position as a world-class University is confirmed by its ranking in the global league tables. 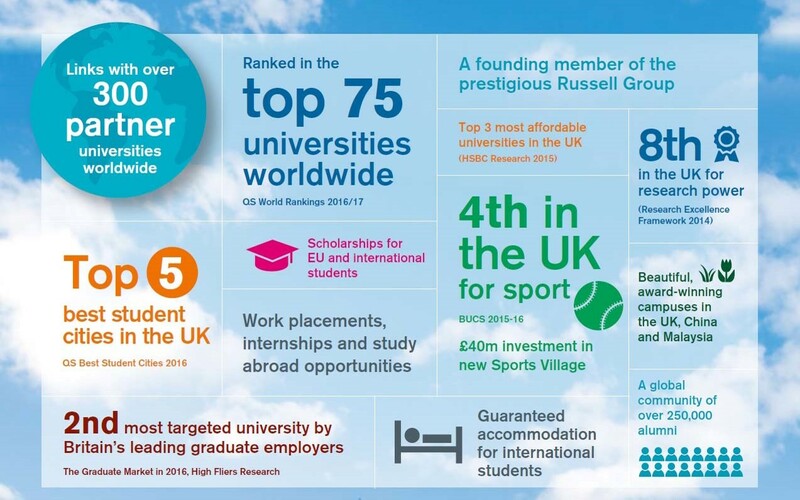 We are ranked in the UK and European top 30 and in the top 1 per cent of all universities worldwide. 1. University Park Campus: One of the largest and most attractive campuses in the country, University Park is the hub of student life. 2. 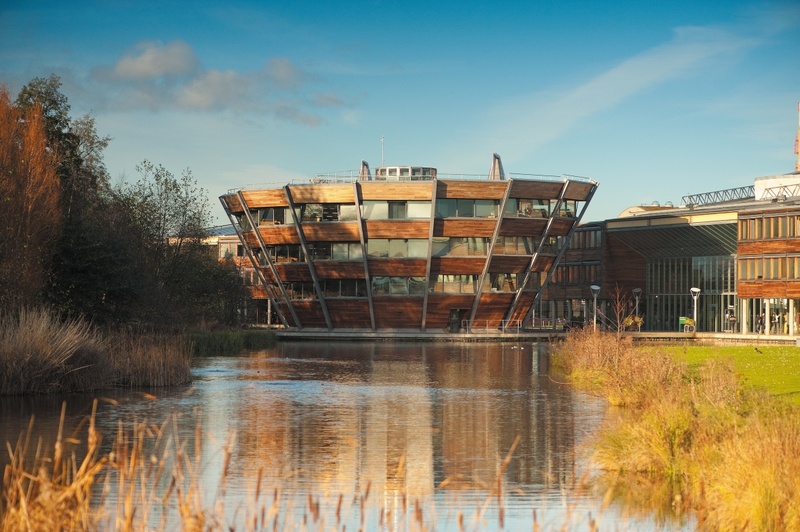 Jubilee Campus: THis award-winning green campus is recognised for its innovative architecture and sustainabllity. 3. Sutton Bonington Campus: This countryside location is the perfect setting for the Vet School and School of Biosciences. 4. King's Meadow Campus: The former TV studios is home to many of the University's professional services and business support departments. 5. Medical School: Based in the Queen's Medical Centre, the Medical School was the first to be established in the UK in the 20th century. 6. University Hospital Sites: As well as the Queent's Medical Centre, the University has sites at the Royal Derby Hospital and Nottingham City Hospital. 7.China Campus: The University of Nottingham was the first Nottingham was the first foreign university to establish a campus in China where it opened Ningbo in 2004. 8. Malaysia Campus: The University's Malaysia Campus became the first campus of a British university in Malaysia, opening in 2000. 1. Art and Performance: Lakeside Arts Centre plays a key role in Nottingham's cultural life. The University also has important community partnerships and two student theatre companies. 2. Conference and Events: The University provides flexible conference and events solutions in four unique locations. Services include accomodation solutions, events planning and a wedding service. 3. Sports: First-class facilities and fantastic opportunities for those who want to play sport at any level. 4. Libraries: Library learning facilities are among the most technologically advanced in Europe. 5. Health: The University's health centre includes a dental practice, occupational health and pharmacy. Meet with INTO Exeter | Manchester | Newcastle | City | Queens !!! 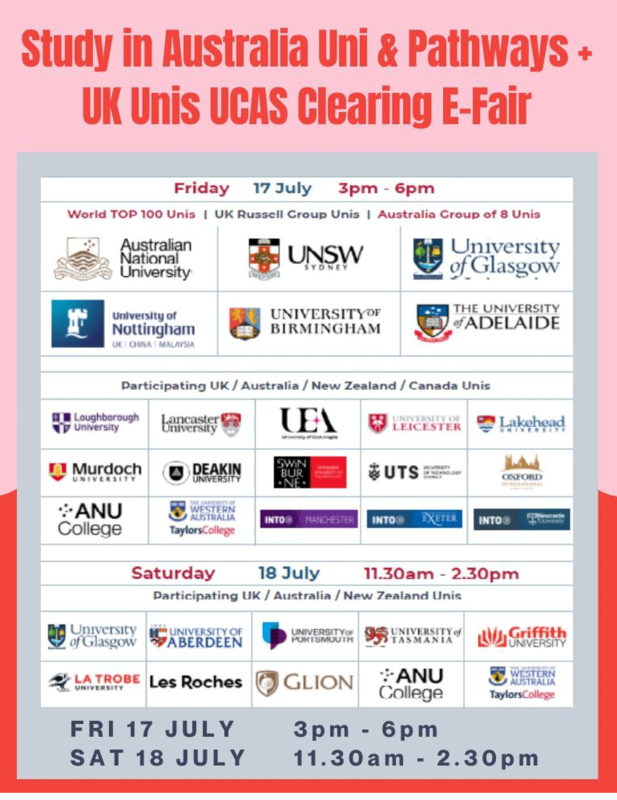 Come and meet Staff from Int'l Office of INTO UK in Singapore! Pre-Register Now to enjoy a Free 30 min session with our counsellor!! !